In cognitive wireless networks, secondary nodes are required to sense the spectrum and to be cognizant of their interference on the primary receiving nodes. In this chapter, the authors show that the throughputs in the primary and the secondary networks have an entangled relationship and need to be considered jointly for optimization. Assuming that the primary and secondary networks use ALOHA as their medium access control protocol, the chapter shows that the throughputs in primary and secondary networks are influenced by the choices of transmission attempt probabilities in both of these networks. Authors show that the interference constraint limits the feasible space of transmission probabilities over which these networks can optimize their throughputs. They propose a progressive transmission probability optimizations algorithm and show through simulation that the algorithm converges to the optimum values of throughput in few time slots. Future research directions and the application of the constrained game theory to the throughput optimization problem are also discussed. In cognitive wireless networks, a primary (licensed) network coexists and shares the spectrum with a secondary (unlicensed) network. The exclusive right to access the spectrum belongs to the primary network and the secondary network’s access is contingent on limiting their aggregate interference to the primary receiving nodes such that it does not hinder the primary receivers in decoding their data. In this scenario, a secondary device has node-level as well as network-level obligations to avoid interference on the primary receiving nodes. At the node-level, it is only allowed to transmit if it does not detect data reception from its nearby primary neighbors. This is typically satisfied by the secondary nodes performing spectrum sensing. The secondary nodes must be alert and vacate the channel they are using, upon sensing the primary signals on that channel (Cabric, Mishra & Brodersen, 2004). Secondary nodes have to make sure that the aggregate secondary interference power satisfies an interference constraint on active primary receiving nodes. The interference constraint specifies the maximum interference tolerable at the primary receivers. The node-level spectrum sensing, however, may be inadequate to achieve this goal as the aggregate interference coming from a large secondary network may still be significant. Therefore, network-wide interference avoidance strategies must also be considered. 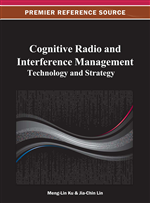 The node-level spectrum sensing and the network-level interference awareness can be achieved by employing cognitive radios in the secondary network. Cognitive radios differ from conventional radios by employing advanced features such as spectrum sensing and adaptability (Haykin, 2005). Given that the primary and secondary wireless networks share the space and the spectrum, throughput in both of these networks is limited by not only the intra-network interference, i.e., the interference among the nodes of the same network, but also by the inter-network interference, i.e., the aggregate interference originated from transmitting nodes in one network on the receiving nodes of the other network (Babaei & Jabbari, 2010a). On the other hand, due to the factors like randomness in the locations of the primary and the secondary nodes, the type of MAC layer protocols and the scheduling algorithms used in these networks which determine the simultaneous transmitters, as well as the fading and the shadowing effects, the intra-network and inter-network and their cumulated effect are random in nature. Therefore, statistical characterization of interference is an important prerequisite for modeling and optimization of throughput in the primary and secondary networks. The throughput maximization problem in a homogeneous random wireless ad hoc networks (i.e., when the wireless nodes all belong to the same network) with nodes distributed according to a Poisson point process and using ALOHA as the medium access control scheme is considered in (Venkataraman & Haenggi, 2004). Assuming that the transmission attempt probability is and with a half-duplex assumption (i.e. the nodes can either transmit or receive data at a given time), the probabilistic throughput1 ( ) can be found as where SINR is the ratio of the desired signal power to the interference and noise power, is the threshold required for successful decoding of data and is probability that the sources node is in the transmission mode and the destination node is in the reception mode (due to the half-duplex assumption)2. With a Gaussian probability distribution assumption for interference, the transmission attempt probability parameter used in the ALOHA protocol is shown to influence on the mean and the variance of interference and through that on the probabilistic throughput. The optimum value of transmission attempt probability to maximize the throughput is found in (Venkataraman & Haenggi, 2004) using numerical evaluation of throughput.